- The only official app with Mobs, Blocks, Items and Characters included at no extra cost! - Add a CAPE and a stand for your model! - Air Print compatible, but a wireless printer is NOT required, generate a PIN code to download your Papercraft on your PC/Mac! Or e-mail a copy to yourself. 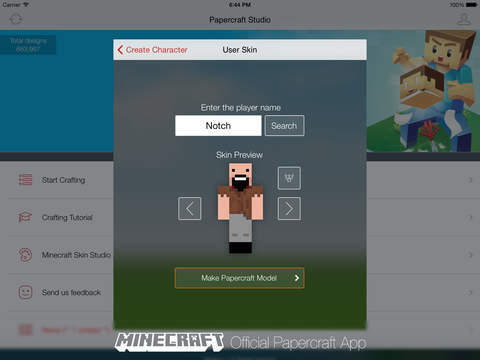 If you have any problems with installation or in-app purchase, found bugs, questions, comments about this application, you can visit the official website of 57Digital Ltd at http://mojang.com/2013/02/minecraft-papercraft-studio-now-available-for-ios/. - Ender Dragon has been added! - Support for Alex skins! - Fixed iPhone 6 and iPhone 6 Plus bugs. 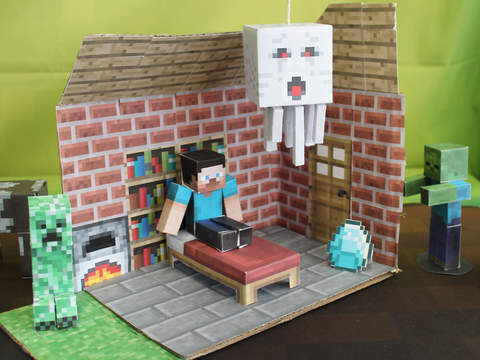 Thanks for your continued support, enjoy making your Minecraft papercrafts! This app now supports the brand new Minecraft skin format! You can now toggle individual arms, legs and even the clothing layer! 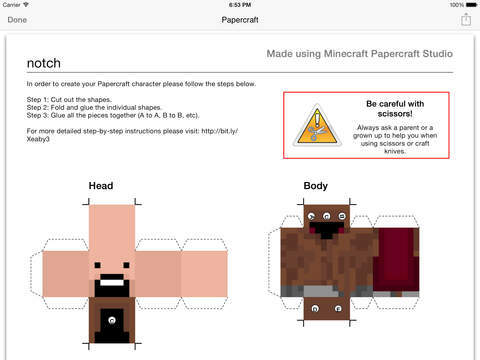 Customizing your Minecraft skin is now even more awesome. This update provides a warning when using a 64x64 skin/username. This is a temporary solution while our team add full support for the new format (which shouldn't be much longer - we're working extremely hard to get 64x64 skin support in this app! ).